If you’re looking for a relaxing family holiday, you will find plenty of scope to do nothing, unwind, and breathe in the fresh alpine air here in Bohinj. It is hard not to feel inspired by the beautiful scenery of the Julian Alps, whatever the season. In fact, when Agatha Christie visited and was asked if she could use Bohinj as a location for one of her crime novels, she famously remarked that Bohinj “was far too beautiful for a murder.” Thank goodness for that! Come and let the magic of Bohinj re-charge and re-energise you. Enjoy the slower pace of life that being on holiday allows; take a gentle stroll through the meadows to the lake to sunbathe, swim or paddle. Chill, read a book, watch the paragliders soar overhead, lounge by the shore or relax on the grass… Soak up the peace and tranquillity and disconnect yourself from the daily routines at home. At the end of the day, you can head back to Pr Méžnarjo to spend time with family and friends in the comfort of a traditional Slovene farmhouse. Take a glass of wine and sit outside to watch village life go by as the sun sets over the mountains. Lake Bohinj and the Julian Alps provide the perfect holiday destination for sharing experiences and creating lasting memories with family and friends. Whether it is sunbathing, swimming, walking, canyoning, rafting, kayaking, rock-climbing or paragliding, there is a wealth of activities for the whole family to enjoy. Our vision when we bought Pr Méžnarjo was to create a home where our family could connect with one another, escaping the allure of technology and screens to spend together in the natural world outside. Slovenia offers all this and more. There are so many activities on offer, and you cannot help but grow closer together when you try something new for the first time, relying on each other for support and encouragement as you test your limits and embrace your fears. For those who want a less adrenaline-filled holiday, there are endless hiking trails, from short walks to multi-day treks. Enjoy immersing yourself in nature; take time to stop and look at the wild flowers and gorgeous butterflies, watch the fish swim about in the crystal-clear waters of Lake Bohinj, and keep your eyes peeled to the sky for golden eagles. Bohinj is a place which makes you want to hold yourself in the present moment, and gives you the space to create shared experiences with the ones you love. From Pr Méžnarjo you can explore the local area by foot, boat, cable car, or car. Hike up the Mostnica Gorge and marvel at the way the incredible power of water has carved deep channels into the rock. Take the panoramic tourist boat across the lake and walk up to Slap Savica – one of the most famous waterfalls in Sovenia. Experience the high alpine world with a trip up to Vogel on the cable car. From here you can head out of one of the countless hiking trails or just relax in the café with a hot chocolate. The views are stunning on a clear day, with Lake Bohinj surrounded by the Julian Alps and the magnificent Triglav in the back ground. There is much for you to explore a little further afield, but still within easy reach of Pr Méžnarjo. Hiring a car is inexpensive, and because Slovenia is a small country it is possible to quickly access many of the main tourist sites. 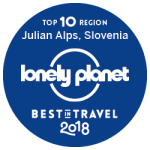 Slovenia is incredibly diverse, with snow-topped mountains, turquoise rivers, spectacular underground caves, an historic Mediterranean coastline, vineyards, spas and castles. Take your pick… maybe a day at Lake Bled, swimming in the lake there, visiting the castle and tasting the famous “Bled cake”. Or maybe you fancy the magnificent caves at Postojna or Škocjan? Or Planica, the home of the Ski Jumping World Cup? A family holiday in Slovenia offers a good mix of action and relaxation, and after a day at a busy tourist site there is nothing nicer than returning to tranquillity of Lake Bohinj and Pr Méžnarjo. Once the day-trippers have gone, head down to the lake for that sunset swim. You’ll probably have the place to yourself!